My I ask if the globe bbmax is exclusively for blackberry only.I try to ask their hotline but d agent sed to me that the hotspot feature of bbmax599 is more different to supersurf999.once u register to a bbmax599 it wil function for unlimited for blackberry user only.once der has other devices connect to u like an android dey wil charge u for additional charge.unlike on supersurf999 on android phone u can use it jzt lyk a wifi router.wat should I do?totoo kya un? BBMax is different to Supersurf. BBMax is only for BlackBerry legacy devices. If you enabled the Mobile Hotspot (prepaid), will not charged you anything. How can I ask them to refresh my service book? Thank you! Tell them your internet connection is slow. If CSR ask you “is there an error?”, tell them none. Does it works on TM? 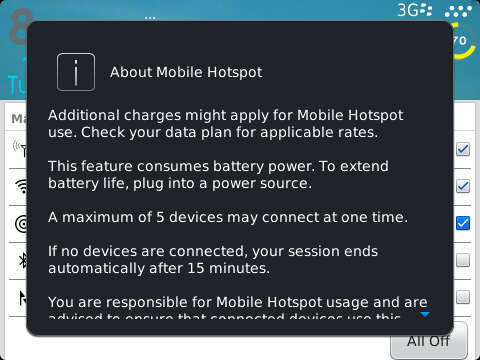 Im using BB 9900. version 7.1 how can i activate my mobile hotspot?? Read the article guys. Thanks. Hi Ian do you know that the BB z10 is now on sale for 12k and the Q10 is for 16K from BB itself? I also found out that Globe has a 999 plan which you can choose a z10 or a Q10 for free. I really love how the interface of the Z10 works but i had a terrible experience on the virtual keyboard on the Iphone4S and and Galaxy S3/4 devices. Review says that the virtual keyboard of the Z10 is good… but how good is it really? Should i take the jump on a full screen device or just stick with the Q10? As far as I know, yes. And yes, Globe offers Plan 999 for BlackBerry Z10 and Q10. Z10’s keyboard is awesome. If you want to try, visit any Globe Store. Play the keyboard of Z10 and Q10 and ask your self which fits you. Hehe. You can unlock your phone via online like CrackBerry.com. Oo thanks, wala pa ba sa greenhills? Hindi ko lang alam Sir. Ian, i checked crackberry n wala na ata sila unlocking service, any other suggestions? @grey- be careful grey, yung z10 na 12k are all stl100-1. Hindi yan LTE and it’s processor are not the qualcomm snapdragon but texas instrument that’s why hindi sya ganun ka “fluid”. And that’s why it’s cheaper. Z10’s that came from globe however are the 100-2 units and is LTE. And now free @ plan 999 so if you want yun ang better option. Or if you want, get the free q10 (also at plan 999) then sell it bnew (higher price than z10 actually) and buy z10 stl100-2 sa kim store online (P13,180) and may extra money ka pa. I got my q10 globe plan 500 one day promo. With unli bb surfing and hotspot.. Does hotspot also works on bbz10 bbmax or maybe use my curve as hotspot for my z10…posssible? How to know that my bbz10 is stl-100-2?